Once again, the Marks Park Sports Club in Emmarentia played host to the annual Avon Justine iThemba Walkathon. 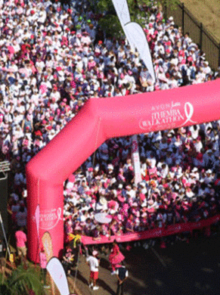 Now in its 12th year, the event took place on Sunday, 22 October 2017 and saw a record 29 500 walkers clad in pink-and-white striding through the streets of Joburg to highlight the plight of women diagnosed with breast cancer. 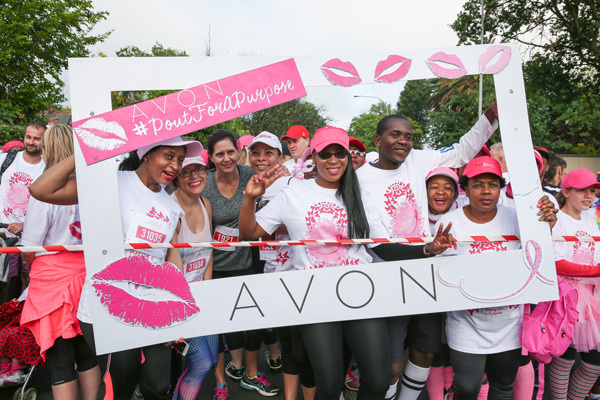 Already the largest event of its kind across its markets, Avon Justine partnered up with woman&home, eTV Sunrise, Kaya FM, Cancer Association of South Africa (CANSA), Wings of Hope, and Look Good… Feel Better to make the 2017 Walkathon the biggest yet. With the help of these key players, important breast-cancer awareness messages – like informing women to get suspicious lumps checked out– were promoted to reach as much of SA as possible. The camaraderie and atmosphere on the day was infectious, as hordes of people and their furry friends walked together in the 5km or 8km routes. 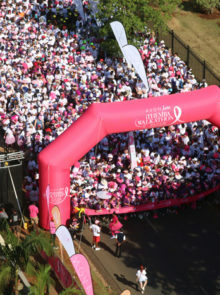 Among the crowd of participants were breast-cancer survivors proudly wearing fuchsia T-shirts and sashes, as well as some well-known faces, such as actress and fellow survivor Lillian Dube, TV personality Penny Lebyane, former Kaizer Chiefs goalkeeper Rowen Fernandez, sports presenter Mpho Maboi, actress Thandy Matlaila, and Kaya FM’s Mapaseka Mokwele, Skhumba and Collin Kgari. With water stations along the way for both walkers and dogs, the thirst was kept at bay, making for happy finishers at the end of the route. At the finishing line, each person received a bottle of Aquellé flavoured water to raise any still-tired spirits. Those who had purchased pink ribbons tied them on the ‘tree of hope’ in remembrance of someone who has overcome breast cancer or sadly lost the fight. 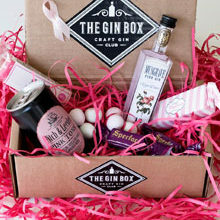 The funds generated from the sale of the ribbons went to the NPO Look Good… Feel Better, helping women regain their confidence post-treatment. A favourite of the annual Avon Justine iThemba Walkathon is the #PoutForAPurpose social-media challenge. Started in 2015, the activity sees women and men, young and old, don a shade of lipstick, pout for the camera, and then upload this image to social media as a show of solidarity. After the walk, participants divided their time between the food zone, where they could buy and enjoy a much-needed hearty meal, and the stage, where Blacque Soul, Rhythm Sessions, Encore and Just Themba kept everyone dancing – even those with aching feet! The 2017 Avon Justine iThemba Walkathon was such a success and w&h would like to thank you for supporting the cause and spreading awareness. According to the Cancer Association of South Africa (CANSA), breast cancer is still the most prevalent form of cancer among South African women, with one in 26 women being diagnosed with the disease in their lifetime. 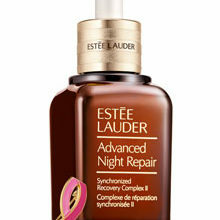 However, if it’s detected and treated early on, there is a 98% survival rate. It is for this reason that Avon Justine is so dedicated to informing women all about the disease, and in doing so, increasing the chances of early detection. From 2001 to 2017, Avon Justine raised and donated an incredible R23 million for breast-cancer education and public-benefit programmes in SA, and Avon global donated over US$1 billion towards women’s causes worldwide.